We’re so excited to help announce the launch of a new (and flawless!) flash sale site called Brickyard Buffalo! Chalk full of brands and companies with great design in mind for moms and kids alike, but while still catered to small businesses and great handmade companies, they are right up our alley! Their newest flash sale is with Freshly Picked, and if you follow any of us on Instagram (@emilyframe, @jmrammell, and @nicolecalleen or @smallfryblog in general) you’ll know that we’re more than super fans of her baby moccasins. Brickyard knows us so well, so they’re offering a pair to two lucky readers! Keep reading to enter, but here’s a taste of the other vendors they are featuring this week, so great right? As they say, one peek and you’ll be joining the herd! 1. Visit Brickyard Buffalo and leave a comment letting us know your favorite item for sale. 2. Follow BB on Facebook. <center><a href=”http://www.smallfryblog.com”><img border=”0″ src=”http://www.smallfryblog.com/wp-content/uploads/2012/11/sfbutton.png” /></a></center>Giveaway is open to US Readers only, winners will be randomly selected and announced Thursday November 29th. Thanks for the info! I love the arrow onesies! So cute. I visited the website! I live the charm necklaces! So simple and cute! I follow on Instagram and like on Facebook. I love the charm necklace and teepee! I’ve been wanting these moccs for my daughter!!! I followed on instagram and Facebook! The arrow onesies ate my fave! I love the unique 11×14 prints! & I follow them on Instagram. we love eleventy-five clothes! Dying to get my littlest a pair of moccs…xo! My favorite is the arrow onesie! It would be perfect for my future daughter! i think my favorite is the triangle necklace. that arrow onsie comin in hot at second 😉 love this site! such a good idea. Entry #1 for button on my blog 🙂 4 more annoying comments coming right up. Loved all the vendors especially the Christmas cards! Following on FB and IG! We became friends on Instagram! I love the Charm necklace and teepee! I love the teepee. What a cute reading nook it would make! I have been eyeing the moccasins for my son for awhile. What a great giveaway. I love the Clemmie teepee! So many cute things to choose from! I “like” bb on FB. Button is on blog x3. I love brickyard buffalo!! Too many fun things…it’s hard to choose. But I do love the baby onesie and the gold necklace. 🙂 crossing my fingers. I am a follower on Instagram! I love the Christmas cards! Button is on blog x4. Wow I pretty much like every item, but my favorite are the Teepee (great price by the way) and the arrows t-shirt. Love love the anchor unique 11×14 print! I went to their website and I think the Bip and Bop Elephant charm necklace is my favorite! P.S. I added the smallfry button to my blog!! I lOvE the Clemmie Sue teepee on Brickyard’s site!! Love the bip and bop charm necklaces. What an awesome site. Love the Freshly Picked mocs for my new baby girl! i of course follow brickyard buffalo on instgram! i love love the scarves and charm necklace! soo darling! I’m dying over those scarves. Oops. This was a duplicate. I didn’t see my first one and tried again. Forgive me. i of course follow brickyard buffalo on facebook!! they are nothing less than amazing! Instagram follower as well! Loving Brickyard Buffalo! I also love the teepee from Brickyard Buffalo! Pretty amazing! I’m following on FB so hard. loving the tee pee,my stud muffin would love! I love the charm necklaces on there right now!! I follow Brickyard Buffalo on Instagram! Would LOVE to have the wishbone necklace or the bowtie for my dog..don’t make me choose! LOVE the doggy bow ties!! So dang cute! I absolutely love Brickyard Buffalo! My favorite sale so far has definitely been Eleventy-Five! I follow BB on FB! I Liked BB on Facebook! Um hello adorable chunky cowl.. Its a must!! I followed on Instagram. Thanks! My nephew Charlie would be sooooo handsome in these! Im following them on instagram! I love the clemmie sue teepees! If I had children I would be getting one! Whaaa?!! That site is pretty great! I love that arrow print onesie from Eleventy-Five. My lil Arlo would totally rock that. I love the organic printed arrow onsie!! I’m going to buy it 🙂 so excited about this site and the cutest products! Love the teepee and the arrow onesie! So cute! Love their necklaces. I’m loving the organic arrow onesies!! And following on Instagram! Thank you. Adoring the vintage posters. As well as those sweet moccasins. Following BB on Instagram also. the organic arrows printed onesie. love. Visited BB and love the Bip and Bop Charm Necklaces… or the Scatter Brain Ties!! Loving the Eleventy-Five arrow onesie so adorable. The teepee is my favorite. Love! I love the eleventy five arrow onesie. I love the organic arrow onesie! Following you on Instagram 🙂 would love, love, love to win these! I love the eleventy-five clothes! Followed all the requirements. I’m in love with the fox neck tie. I loved the a vintage poster offer – loved the argyle bear poster. Followed on FB/IG as well. that arrow onesie is adorable! probably my favorite thing. Love the hand knit chunky cowl! in love with the teepee and necklace! im following on IG and liked onfacebooK! this is awesome! i want to win these moccs! I just love those dog bow ties! Liked on FB and IG! I would love love a vintage poster to hang in my newborn daughter’s nursery!!!! And of course, those moccasins are to die for!!!! Love that cute arrow onsie!! Followed the page and liked on fb!!! I love the eleventy five clothes! That arrow onesie is to die for! Entry #1 for Moccs: love the site! And love the arrow onesie! Entry #2: following on Insta! Entry #3: liked on FB! I liked on fb and followed on Insta! I would love the Christmas cards! I’ve been wanting a pair of those adorable moccs for my little Elijah! Follow on Instsgram and FB! I absolutely LOVE the eleventy-five arrow onesie! I loooove these moccs and would some for my little man…and a few or my friends babies! I am absolutely in LOVE the eleventy-five arrow onesie! I followed the heard on Instagram! Lovin those Infiniti scarves in there! I love the organic arrows printed onesie. I love freshly picked moccasins, I would love to with this for my baby girl. I visited the page, follow on Instagram and Facebook. I became friends with BB on Facebook…fingers crossed! Love love that arrow onesie from eleventy-five! My kids would love those teepees!! Everything is so cute!! Following Brickyard Buffalo on Facebook! Following on Instagram as well! I love so many things on this site… If I have to pick one, it’s the teepee right now. My kiddos would love it! LOVING the printed arrows onesie!!! added your button to my blog! comment #2 for the button! I like BB on FB! comment #3 for your button! comment #4 for your button! Oh decisions decisions…..I’m loving the leather and cotton clutches. They’d make the perfect Christmas gift for all the fashionable ladies in my life. I also liked on Facebook and followed on Instagram. need those mocs for my babe! Love their October InK Christmas Cards!! loving the clutch from c. alexandria! Such a lovely site. I am eyeing those paper garlands. 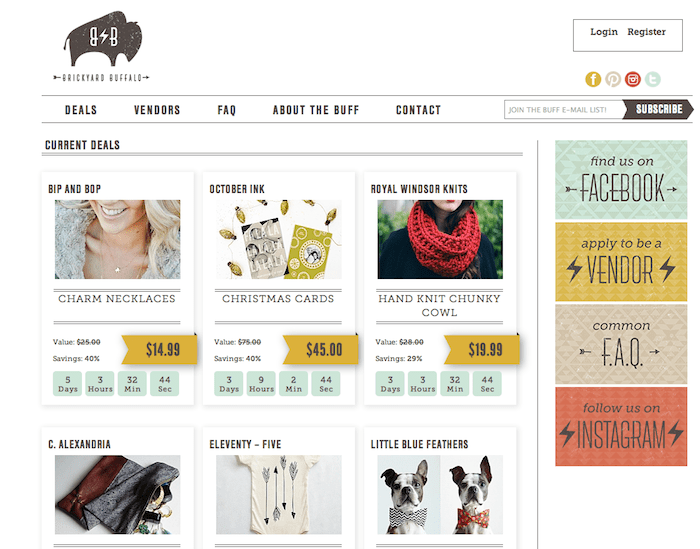 I love many items from Brickyard Buffalo, but my favorite one is the Teepee, is so adorable. well thats for my baby, but for me I love the wishbone charm necklace. Fingers cross to win a pair of the adorable freshly picked moccasins. Following on facebook, and instagram. I’m a follower on FB! The moccasins are my favorite! Love this! Would love to win my little boy some moccs! Following on Insta and I love the handmade chunky cowl neck on brickyard buffalo! I love the arrow onesie on buffalo’s site. Love the arrow onesie! But the teepee is my favorite. I need to get one for my daughter! Followed on Facebook! And, I love the chunky cowl knit scarves!! I love the traingle hammered necklace! And the teepees, and the clutches, oh geez, I can’t pick! Crossing all my fingers! I am loving the cowls omg I am sort of obsessing with them right now. I love the gold charms! I love the eleventy-five arrow onesie. So cute! I am now obsessed with Brickyard Buffalo! Coolest idea ever. My favsies thing on the blog right now is the hammered triangle necklace. I want. I liked them on the FB! Oh and I added your sticker to my blog because for reals I want to win and I love small fry! OHohoh my baby NEEDS a pair of these! I would pick the Christmas cards, or the cowl…too hard to choose. Also, I liked them on Facebook. I so hope I win!!!! Also, follow on Instagram? Done. I LOVE the doggy bow ties – my little guy needs one for sure! I’m following BRICKYARDBUFFALO on facebook! I live the organic onesies with the arrow screen prints! Too cute! I already follow bb on instagram! Come on… Let this be my lucky day! Oh man cutest arrow onesie!! I also love the oversized scarf! I’m now an IG follower-holla!!! Oh I love that teepee and that beautiful gold triangle necklace! Love the arrow onesie and the tepees! so rad!! i am totally loving alexandria’s leather and cotton clutches- but everything is so great! love learning about wonderful little sites like this!! I love the hammered gold triangle necklace. My favorite is the eleventy-five organic arrows printed onsie. Too cute!! Now, hope I win some cute cute mocs! Ooh. Too cute! Would love to be entered for the Freshly Picked baby moccasins! Love the vintage posters AND the arrow onesies! Visited the website. “Make Pie Not War” necklace makes me laugh! Love that. Liked Brickyard Buffalo on FB. So excited for this new site! The new knit cowls are beautiful! I really like the gold hammered triangle necklace! Placed Small Fry button on blog! Cute! I want some! I am on the hunt for Christmas cards do I will go with that! “following the herd” on Facebook. I have been following them on Instagram and LOVE them! I am following them on FB- I’m obsessed with these Mocs! I would ADORE these MOCS for my little guy! lastly, pretty sure i need a chunky cowl and my little mister needs an arrow onesie! added button to my blog! Please Pretty Please PLEASE pick me! I’m getting more and more desperate! Visited their site and love the adorable Christmas Cards! Following on IG, Facebook, etc… Love, Love Brickyard Buffalo! And Would LOOOVE a pair of baby moccs for both of my girlies! Favorite thing right now on Brickyard Buffalo is their awesome chucky cowl knits! Love love! I love the clemmies teepees! Plus everything. Part of the hurd now! Liked BB on FB and IG! I am lovin on the gold triangle necklace! I follow BB on Instagram! I’m really loving the charm necklaces and Leather clutches! Love the charm necklaces and the tee pee! Liked on FB and following on IG. Im in love with the Clemmie Sue Teepees! Great giveaway! I love the arrow onesies! Love the Christmas cards & the arrow onesies! Love the gold hammered triangle. SO cute! I love the little charm necklaces. LOVE everything, but I keep thinking about that onyx clutch. that eleventy-five onesie is adorable! love brickyard buffalo. thanks! i follow BB on facebook! i love the moccs, so cute for my little boy!! I love the arrow onesie! I’d love a pair of these for my little babe! Love the tee pee! I’m also loving that cowl scarf. So snug! I’m following them on instagram! Liked you on fb :). I want one of everything but if I had to choose just one thing my son would have so much fun in that tee pee! I’m following brickyard buffalo on facebook! I’m following brickyard buffalo on instagram! I hope I win so badly!!! I’ve been dying to have a pair of these for my son. I would love a teepee off BB. I follow BB on insta! My favorite is the arrow onesie. Saw Clemmie Sue’s teepees at the Bijou last weekend – love! Following on insta as well. Love the concept of BB! Liked on Facebook, Instagram and I love the arrow onesie and tepees! I follow brickyard buffalo on IG! my fave item is the teepee! i want one of those for my kids! so cute! This momma would love a pair of mocs for my mini me. We love the clemmie sue teepees. And momma made sure to follow @smallfryblog, @brickyardbuffalo, @nicolecalleen, @emilyframe and @jmrammell on IG. Also liked Brickyard Buffalo on Facebook. I think this is a great idea! They have chosen some really cute stuff. My favorite is the chunky scarf. I love cozy scarves and that one looks so cozy. Yay for moccs! Thank you. This momma is lusting over the wrap style watch. This momma loves the Gold hammered triangle necklace. This momma loves the Organic arrows printed onesie. Momma loves the Christmas cards! Mocs for my little one please!! Momma loves the paper garlands. I liked BB on Facebook and follow them on Instagram. My fave is the teepee!!! I follow brickyard buffalo on Facebook! My favorite item is the darling teepee My daughter would have so much fun with that! I liked BB on facebook. So hard to choose a favorite! But I think my girls would love the teepee. And the arrow onesie is so cute! I adore those doggie bow ties!!! Need one now! i love feral watches…and the hand knit chunky cowl by royal windsor knits is GORGEOUS! i also liked BB on facebook! my fingers are crossed, those moccasins are darling. those fox ties are pretty awesome! and the arrow onesie is great too. I love the Leather and Cotton Clutches! I love following them on Instagram! I am following on Instagram and Facebook. My favorite deal is the Bip and Bop Charm necklaces! I love the baby moccasins and all of the cute colors they come in! aand just ordered the arrow onsie on their website. 🙂 thanks for the tip this shop is amazing!! Such a darling shop! Follow them on fb and insta. My absolute fave would be seeing my little babe in that arrow onsie peeking out of their teepee! Love Brickyard Buffalo! Going to be featured this week! I joined the herd. Ps. Love the styling of your blog! Following Brickyard Buffalo on instagram. my fave: feral watches & the organic onsies! Lovelovelove freshly picked moccs! My little guy would look adorable in them! i love the charm necklace by bip and bop! i love the teepees. so fun! The arrow onesie is so perf! Following them on FB & Insta! I like the charm necklaces for sale right now. LOOOve. I am loving this new website to shop at. I looove the charm necklaces! I love the arrow onesies!! I follow BB on Instagram. I also liked BB on Facebook. i adore the arrow onesie! and the chevron painted teepee! adorable! I think I need that arrow onesie! I love the ruby & sue hair bows! I love it all! Such a neat site. I love the arrow onesie…and the prints from A Vintage Poster. And the screen print neck ties are also so adorable. i liked BBB on instagram! i liked BBB on FB! i love love love the poppy moccs! for baby girl due in february! added the small fry button to my blog- the icon isn’t showing up though?? arrow onesie is a must! Love the prints from little Boston print shop! I follow BB on Instagram, but I just liked them on Facebook as well. Really thinking about that tipi as a Christmas gift. In love! Whoops! I was confused by the placement of the statement in parenthesis and didnt realize it meant for each step (I thought it only pertained to adding the button) please use first comment to show I follow BB on Instagram. This comment is to show I liked them on Facebook. I love the make pie not war necklace!! I just like BB on facebook! I started following BB on instagram! I am new to your blog and have never seen those mocs before! They are the cutest ever! I liked BB on FB and visited their website! I like the wishbone necklace that they have right now. I follow BB on FB. I love the CLEMMIE SUE TEEPEES! And I added the Small Fry button to my blog! I would love one of the clemmie teepees for my daughter Arrow:) Super cute! I am following @brickyardbuffalo on Instagram! I liked ’em on Facebook, too! i am so glad to know about this fun site! i am loving the ruby and sue bows right now. it makes me want to have a baby girl!!! so cute! I would love to get the teepee for my 2.5 year old son. I might never get him out of it! I tried to add the button to my side bar but it isnt showing the image or linking to the site. Help? Points for trying? Soooo many cute things… but i think i need that teepee for the nursery or the awesome old camera iphone case. I’m a follower. I am in love with the arrow onsie. I’m a follower on Instagram. Love! I’m following BB on insta! I visited their website (so adorable) and I love the arrow onesie! following on instagram. love them! dying over the teepees and the gold hammered necklace! It’s definitely a toss up between the eleventy-five onsie and the foxy ties. My husband would totally rock the foxy ties. You know, cause he’s foxy. poopsicles and gravy i want those mocs! SO MANY amazing items! Its hard to choose what my favorite item is! I love the teepee or arrow onesie for my daughter or perhaps my favorite is the fox tie for Fiance! Such a great collection of items, I’m excited to see what else will come! This is such a cute site!! I love the Teepees and pretty much everything else! love the Grey Medium Dot head wrap/infinity scarf! Love the leather and cotton clutch.. I love this blog! I visited Brickyard Buffalo and I love the vintage prints! I added them on instagram! I would love an Armelle Necklace….I love that jewelry always fits…even after a new baby!